It’s been five and a half weeks since I started my new job. Time has flown by. I’m getting just about up to speed with my questionnaire and report writing. I’m used to waking up at 6:15 now. I even kind of like getting dressed up for work. The other day I wondered what my co-workers would think of me if they saw me out in the “real world” or bumped into me grocery shopping. In the summer I’m usually in cutoffs and a tank top–it would be funny for them to see “Aura in the wild,” dressed like I normally did while working at home. Last week my coworkers challenged me–they hear me talking about food so much and said I was all talk, no action (as if!) so I brought in a pan of blueberry banana baked oatmeal. That showed them! It was great to stand amidst the cubicles eating breakfast with my new colleagues, especially because it has been a while since I made baked oatmeal. It was a dish that was welcomed back in this house, no problem, and probably the recipe I have cooked most often from my blog. You can find the recipe here if you are interested! Warning: if you plan to make baked oatmeal for a function, for work colleagues, or for anything that requires you to take the whole pan, please, please promise me you will make a pan for your family. Let’s just say that filling the house with the aroma of baked oatmeal early in the morning and then whisking it away did not go over well! I ended up making another pan that same evening to avoid further pouting (and I’m talking about adult pouting). Life has been busy, busy, busy. And a little frustrating at times. I spent about 6 hours looking at refrigerators online this week, was ready to click the “buy” button, and then realized that the width of the refrigerator wouldn’t work in my kitchen….and then realized that the width of most side by side refrigerators wouldn’t work in my kitchen….and then stayed up really late until I found one (one!!!) that would fit, though it may require removing the baseboard to the left of the fridge. Spending hours this week fridge shopping has made me feel like my life is a little less than exciting of late. So I’ve decided (this evening) that I need to start focusing on adding more enjoyment and me time back in so I don’t feel shackled to the grown up parts of my life. Cobbler before going in the oven. That thought (and a late evening walk downtown with the pup) made me recall a few weeks ago when Drew and I took a leisurely walk downtown on a gorgeous Saturday morning. We stopped to get coffee, met up with a friend that brought a special treat from the Upper Peninsula, walked across the river, ran with Poppy (the pup) up and down one of the big mounds in Ah-Nab-Awen park, and finally (and best of all!) picked and ate as many mulberries as we could stand until our fingers were black. Turns out, the pup is crazy for mulberries and ran in circles everytime we gave one to her. It was pretty wild to see my little mulberry junky flipping out over the berries (I do have to say though, that Poppy is a very healthy dog–she loves quinoa and steamed veggies and the occasional sprinkling of blueberries in her dish). It was about as perfect a morning as anyone could ask for. And in my moments of frustration, I’ll try to remember that simple and beautiful morning and recreate it on as many Saturday mornings as possible this summer. We were invited to dinner that week and we were tasked with dessert. 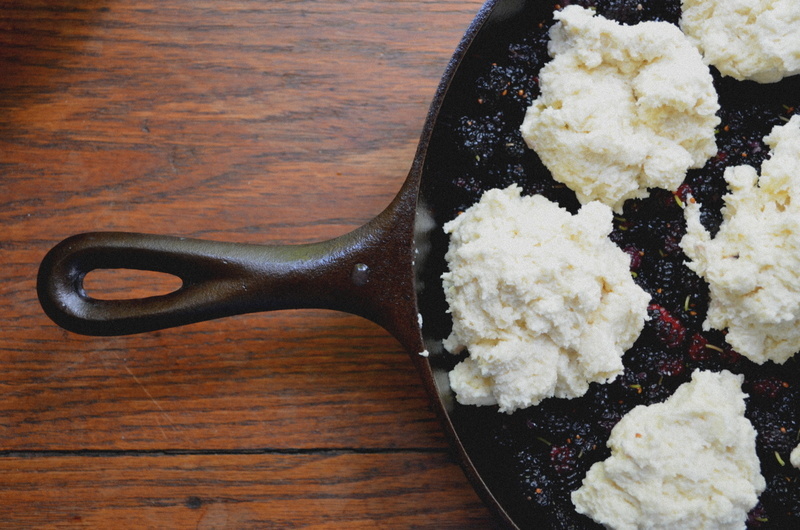 Drew went back to the mulberry trees downtown to pick several cups of berries and we whipped up this cobbler. 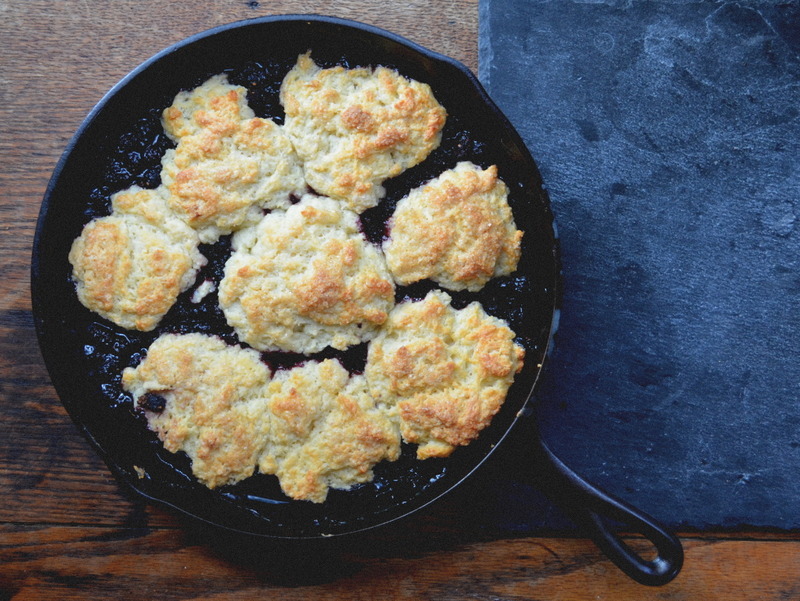 The biscuits are rich but not nearly as unhealthy as some can be and the mulberries were beautiful in the skillet and a unique taste and texture for us compared with other berries in cobblers. 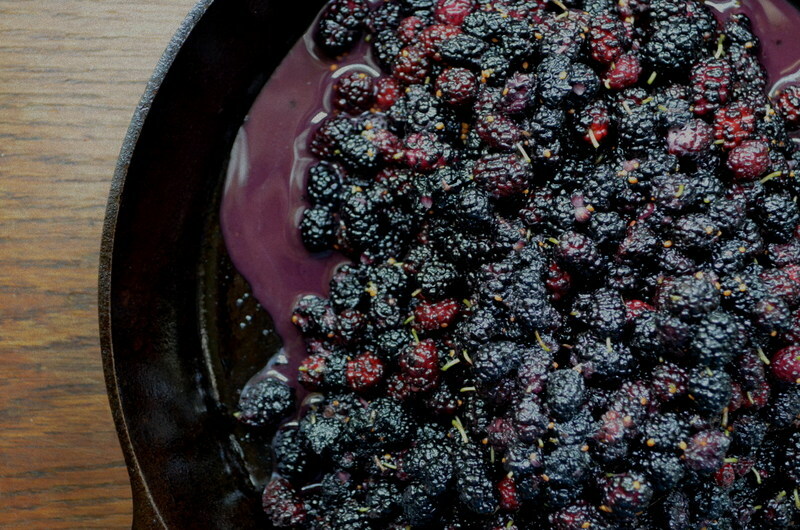 Keep in mind that you can make this dish with blackberries, raspberries, blueberries, peaches, plums……you name it. Just choose your fruit and mound the biscuits on top, bake, and voila–a simple and well-loved summer dessert. Mulberries are about to be out of season (and the sidewalks are stained black with fermented and trampled mulberries) but now that blueberries are in season in Michigan (woooohoooo!) you’ll want to make this dish pronto. 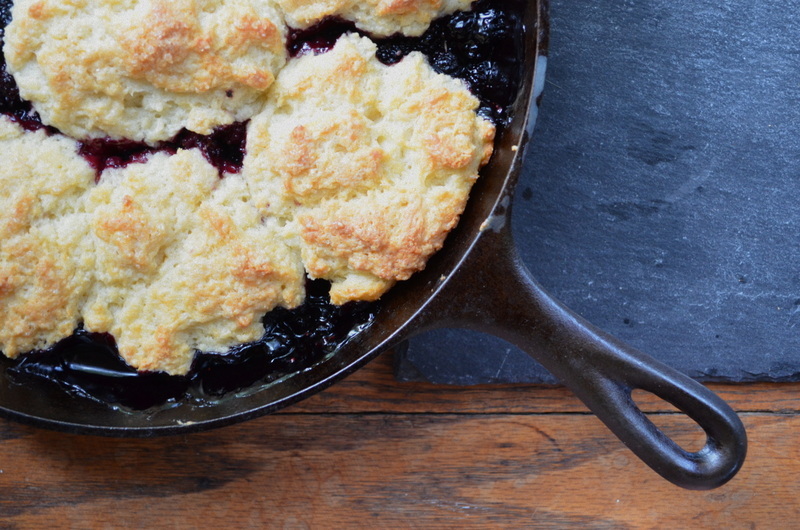 I based my recipe off of a Cooking Light recipe from July 2002–for the original blueberry cobbler recipe, click here. To prepare filling, combine first 4 ingredients in a cast iron skillet or an 11 x 7 baking dish if you don’t have a cast iron skillet. To prepare topping, lightly spoon flour into dry measuring cups; level with a knife. Combine flour and next 4 ingredients (flour through baking soda) in a large bowl, stirring with a whisk. Cut in butter with a pastry blender until mixture resembles coarse meal. Stir in yogurt to form a soft dough. Drop dough by spoonfuls onto blueberry filling to form 8 dumplings. Brush dumplings with milk; sprinkle with 1 teaspoon sugar. Bake at 350° for 50 minutes or until filling is bubbly and dumplings are lightly browned. Serve with a scoop of vanilla ice cream. Serves 8: 288 delicious calories, 8.3 grams of fat, 4.9 grams of saturated fat.